This Callaway brand putt alignment tool for golf balls helps any golfer mark and line up their ball like a pro. 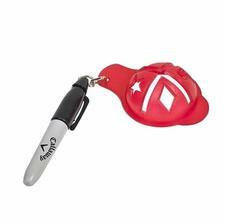 Made of plastic and includes putt align tool and mini sharpie marker. If you have any more questions about the Callaway Golf Pro-Line Putt Align Marker (Putt Allignment Aid Marker); do not see the model you are looking for; need custom options; or prefer to not purchase online, then please call us at (630) 656-1291.